Lamb can either be a succulent cut – bursting with flavour – or a tough piece of meat you wish you hadn’t bought. Similarly to beef and pork, it’s all about the cooking method. Which is why we’re showing you which cuts to roast, fry and even braai! Let’s explore ‘Meet the Sheep: Lamb Cuts & Uses’. Lamb isn’t for everyone. In fact, the St. Marcus Team is pretty divided on the subject. However, as a lamb lover myself, I couldn’t resist the urge to charge in with some handy tips on cooking Lamb. 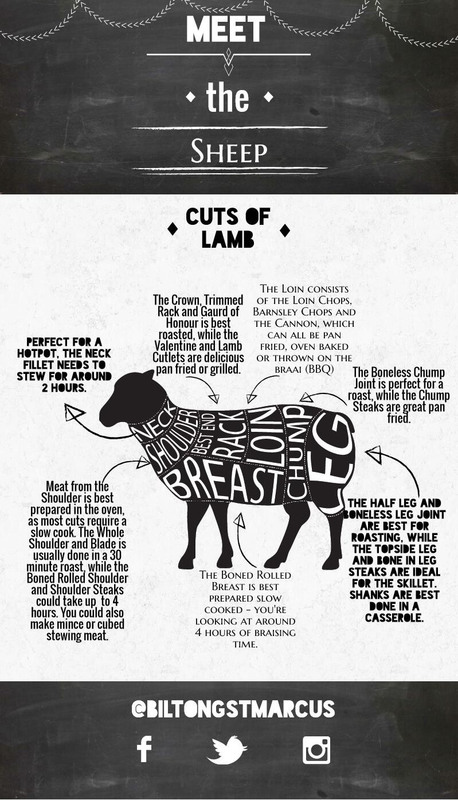 So with our ‘Meet the Sheep: Lamb Cuts & Uses’ guide I’d like to point out that many cuts are better suited for a slow cook. Completely worth it in my opinion, just by the way. Despite that, you’ll also find delicious cuts like Loin Chops that are wonderful on the braai or in the pan.